Synpiece: A wearable technology that changes the wearer's mood. Users of the Synpiece can adjust the 'color' of their experience, which adjusts psychological traits mapped to hue (emotion), saturation (intensity) and value (complexity). The Synpiece can be used by brands to increase users' engagement. In your email client, this is saved as a draft. There's some more text at the bottom. You don't remember typing it: "become hypersaturated." 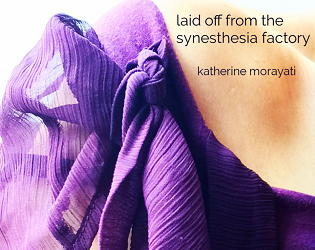 Laid Off from the Synesthesia Factory is a work of interactive fiction by Katherine Morayati, an 2015 XYZZY Award winner for Best Use of Innovation.and a nominee for Best Writing and Best Implementation. It was selected for Hand Eye Society's WordPlay festival showcase in 2016. Download is optional, but recommended; the story-generation component, for instance, relies upon it.